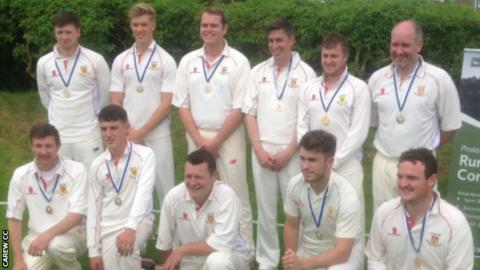 A Welsh cricket side say they were "hard done by" after a controversial declaration by their rivals denied them the chance to win the league title. Cresselly won their 'title-deciding' match against Carew but it was the latter who ended up as champions. Carew started the day 21 points clear and with 20 points for a win, declared on 18-1 to deny Cresselly the chance of any batting or bowling bonus points. Cresselly say Carew's decision was "at odds with their title of champions". The Pembroke County Cricket Club Division One side said: "We feel hard done by not being able to play a proper game." Carew have said they "stand together," in a short statement. The decision has become a matter of controversy as Carew find themselves being accused of breaking the so-called 'spirit of cricket'. Although Carew's tactics were within the rules, such a decision is rare and considered by many to have gone against the true spirit of the game. Former Glamorgan captains Mark Wallace and Steve James are among those to condemn Carew's decision. The battle for the Division One title between leaders Carew and second-placed Cresselly came down to the final match decider. But Carew appear to have worked out the mathematics which would see them lose the match but clinch the title if they denied their opponents any batting or bowling bonus points for batting and bowling. Carew started with a 21 point lead and Cresselly received 20 points for their quick victory. So after being put into bat, Carew declared on 18-1 after just 15 balls with Cresselly reaching their target in two overs and winning the game, but losing the title by a single point. The League rules state that one bowling bonus point is awarded for every two wickets taken in an innings. While batting, one bonus point is awarded for every 40 runs scored, up to a maximum of five. Cresselly have commented on the situation via their own statement. "We obviously feel hard done by at not being able to play a proper game to determine the winner of Division One," they said. "Having beaten Carew in the league and village cup we felt confident we could do it. "On the toss, our captain elected to field as we felt it was the best way of winning the game with such a tight margin. "Thinking that Carew would want to beat us the right way and show everyone they are indeed the very best, their choice to declare and deliberately lose was at odds with their title of champions of the county. "Some people have asked if we think 'deliberately losing' is match fixing and if we wanted to go down that road. We will leave that up to Pembroke County Cricket Club to decide. "We are very disappointed but we want to move on." A Carew statement read: "In consequence of the coverage of this matter in some sections of the media, we, as a club, have decided not to comment further. We stand together." The executive of the Pembroke County Cricket Club - responsible for enforcing the regulations within Pembrokeshire - will meet on Wednesday. Although no regulations have been broken, it's expected Saturday's match will be discussed. County club secretary Steve Blowes has told BBC Wales he is personally disappointed by Carew's decision even though they have not technically broken any rules.